Appeon Mobile 2.0 is progressing nicely, and we want to express our sincere gratitude to the dozens of Pros and Enterprise beta testers who have used this product thus far. For those who haven’t yet explored Appeon Mobile, we’d like to remind you of several tutorials which we’ve recently released. We’d also like to remind you to submit your amazing mobile apps to inspire other developers. Appeon Jumpstart session is a one-to-one 1-hour live training, aiming to help new Appeon users to get started with Appeon product quickly. This training begins with an orientation session on how to install and use Appeon products, followed by several fun and informative opportunities to talk with our Appeon experts. Request a Jumpstart session now and tell us when is best for it. How many times have you seen these behaviors in a Mobile App? Like Us on Facebook. Post this to your Facebook Timeline. Tweet this on Twitter. Call Customer Support. Wouldn’t it be sweet if you could implement these kinds of behaviors in your Appeon Mobile app? This article will show you the all tricks you need. Be one of the first to see PowerBuilder applications on Android devices, as Armeen Mazda hosts a webcast in February on all things new for Appeon Mobile! Date and time are to be announced, so check back to our website for more details, or join our Facebook and Twitter accounts to receive a notification. Following the announcement of PB 15, your next chance to get up close and personal with Appeon and PB experts is at the Charlotte PowerBuilder Conference! This Conference, presented by NCPBUG and Appeon, will bring you the latest news and information on all things about PB and Appeon. We’ve listed the top 5 reasons why the upcoming PB Conference in Charlotte cannot be missed! From seeing the official SAP road-map for PB, to talking and attending workshops with Appeon experts! STD is very pleased with how the PB Community has embraced its new Integrated Framework for both PB Classic, Appeon Web and Appeon Mobile. Now the PB developer can build Win32, Winform, Web and Mobile based applications from just one framework source! STD are also very pleased with initial adoption and "usage comments" of their new Web Service framework for PB Classic and Appeon Mobile as well. STD would like to thank everyone for their continued interest in the frameworks and all the positive feedback and reviews they received in 2013 from the PB community in general! STD earlier this week released its figures on the various downloads of their framework for PowerBuilder, EAServer, Appeon and Web Services for 2013. While the framework downloads in total were way above the previous year, the usage of the PB.Net framework was very low. STD has also received feedback from the PowerBuilder Community on its use and plans for the PowerBuilder.net IDE. Based on this research and actual feedback it is now evident that the PB community is not adopting the PB.Net technology for general use. 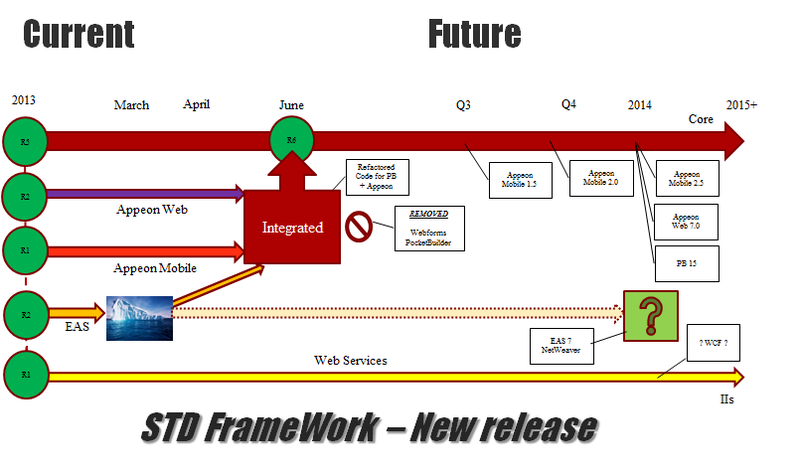 For this reason, STD is announcing the End of Life of the PB.NET version only of their frameworks. Should the situation change in the future, STD may reconsider reinstating the PB.Net support. Instead, based on actual feedback from PB developers, IT shops, etc - STD feels that their best focus of development resources should be placed on Web Services (for PB Classic), PB Classic itself and the Appeon Web & Mobile product areas.